Just a place for my cards, but you may find a few other things . . .
Today is Day 4 of Raven's 80's blog hop and it's totally AWESOME!! **I'm posting every day until I announce the winner on November 5th, comment on each post for more chances to win the blog candy!**. I have to say the wonderful thing about crafting is that you get to make something your own. I figured this would happen, but it looks like I'm not the only one that loved (OK, still LOVES) Ghostbusters! I know that Mary at CardzTV had a very similar idea. Since today is Halloween, I knew this was the card for me to post today! The ghost is from Paper Doll Dress Up and the sign is one that I made using my Gypsy (I can't remember what cartridges I used to make it). I printed off the saying. The background paper was given to me and I didn't see a company name on it. Make sure you check out these wonderful ladies (if you haven't already)! You may have to scroll down to see their creations for the blog hop!!! Thanks again for stopping by!!! :) Make sure you you look at Day 1 of the 80's Blog Hop for info on the blog hop candy!!! Yep, it's Day 3 of Raven's 80's blog hop! **I'm posting every day until I announce the winner on November 5, comment on each post for more chances to win the blog candy! ** This one is another VERY simple card, but I thought it might be fun! I HATED/LOVED my Rubik's cube. So much fun to play with, yet so frustrating (and yes, I know there's a trick, but I still get frustrated). :) Like I said, very simple; fun though! Make sure you check out these wonderful ladies (if you haven't already)! You may have to scroll down to see their creations for the blog hop!!!! Welcome to day 2 of Raven's 80's Blog Hop (we're celebrating her Birthday)!! **I'm posting every day until I announce the winner on November 5th, comment on each post for more chances to win the blog candy! ** For Day 2 started thinking about what movies I remember watching. One of my favorites is/was Goonies! HAHAHAHA - I'm still laughing! Ok, sorry! On to the card! It's TOTALLY a Blog Hop!! One of my first thoughts when I heard '80's' was thinking back to those shirt ties. You know the ones I'm talking about - they look like a 'no' sign or a circle with a line through it. I used to have a BUNCH of those things; all in florescent colors of course!!!! So . . . I had to make my first card of the week with the brightest colors I had, and of course those shirt tie things. To answer your question - yes, the shirt/ribbon tie things on the card move (my kids loved playing with them). :) This card was really simple, but still fun. 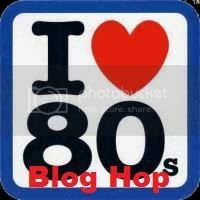 Leave one comment on one or all of my 80's blog hop posts. So, if you comment each day you'll have more chances to win rather than if you just comment on one post (I hope that makes sense). Only one comment per post, please! That's it! If you'd like - take a look at some of my other projects/creations to see if you like my simple style; YOU DO NOT have to be a follower (unless you want to). Sorry, but US residents only. I hope you understand!! All comments need to be in by Midnight Thursday November 4th so that I can pick a winner and announce the lucky person on Friday November 5th. I'm so glad you stopped by!!! Make sure you head over to visit Angela over at Creative Crafting next!! You'll love her work - she's amazing! If you happened to stop by my blog first, just make sure you start at the beginning with Raven at Love 4 Stamps! If you get lost, here's the list of all of the creative ladies to hop to! I've Been Surprised and Boo'd!!!!! I still can't believe it! 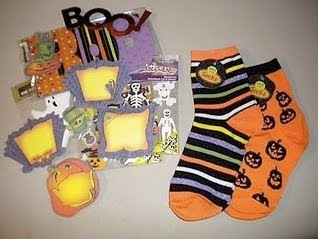 All of that beautiful paper, stamps, stickers, ribbons, brads, buttons, bling (Stickles) . . . WOW!!! Diane - THANK YOU!!!! You have no idea how much you made my day!!!!!! On to the large envelope in my mailbox along with the box. We're not sure what happened, but all we know is that I got an empty envelope. She was sweet enough to send me a different mini album for me to use for our outdoor pictures. Well, as a surprise to me, she just sent me a Halloween mini album!!!!!!!!! For no reason at all!!!!!!!!!!! AWWWWW!! She sent a little note telling me I've been "Boo'd". HAHA! I laughed so hard - I don't mind being boo'd. :) Here are the pictures of her amazing album! Rhonda THANK YOU!!! **Like I said, she actually GIVES these away (I know, right?!) Click here to put your name in the hat for a Thanksgiving mini album; you'll be glad you did, these are worth the chance!! ** Rhonda - I'll send you pics as soon as I fill it up. I know we'll have some pumpkin carving ones in there for sure!!!! Thanks again!!!!!! Here is the lineup of all of the creative ladies that I get to hang out and hop with! Our little girl just got her pictures back from school this week. She was so excited . . . OK; I admit it, both me and my hubby were excited too (she's our oldest, what do you expect?!)!!!!! We had to send a picture to my parents (oldest grandchild - you know their excited too)! We made a cute card to hold the picture of our beautiful little butterfly! The butterflies are from Gypsy Wanderings. I can't remember what font I used - sorry!!! The paper was from my scrap box so I'm not sure where the butterfly paper came from. I know - I need to do better at keeping track of stuff like that!! :) Thanks so much for stopping by!!! I'm back!! Once again - I'm so sorry for the lack of posts as well as the lack of visits to every one's blog! I'm back to reality with my little ones (while their Dad is still hunting). I have a lot on my plate and am happy to get back to it! I have three blog hops that I will be participating in at the end of this month and the beginning of the next. More info is coming on those! I am also helping out with Halloween things for the elementary school; AND helping with a craft day for my church (Super Saturday). I'm helping to plan, purchase and teach for the craft day. I'm really excited, but again - it's a lot on my plate! This card turned out better than I originally hoped! I made it for one of the ladies in my church group. She was helping me with a couple of things and I wanted to give her a card to thank her for everything. This is my first Z-fold card - what do you think? I liked how it turned out!!! :) The tree is from Gypsy Wanderings. I tried using the non-brand name Stickles on the tree. I like them; I don't own any actual Stickles, but these seem to work just as well as anything I've seen used. Thanks so much for stopping by!!!! I'm thinking about a lottery ticket . . .
One of my (many) weaknesses is the fact that I am a very passionate and . . . um . . . energetic person (it really can be a curse). I tend to volunteer for MANY things. I figure if I'm blessed with all of these things in my life - I should share; right?! :) My church group is something I volunteer myself for, and I mean I volunteer for just about EVERYTHING (sometimes I'm shocked they don't tell me to stop volunteering). Well, we have an activity with the ladies where we get together and can make several things. They asked (since I volunteer all of my ideas anyways) if I would help come up with more ideas. There are several things I found online and thought would be simple to try. This was one of those ideas. I just took some matching paper and Mod Podged it onto the letter. I like the colors and figured if they fade or I get sick of them I can always put something different on it. You just attach a ribbon and hang it from your front door. What do you think? I like it! Sorry about the shadow, I was having problems. Thanks for stopping by!!! Let me know what you think, or if you have created something fun and easy recently (I love help)!! :) TFL! So there's two things with this card. As I've mentioned before I am a big baby!!!!! No, seriously - I am!!!! Well Sunday night I was reading a post from Paula at More Than Favors. The post I was reading was about a little boy named Hunter. Long story short, this may be his last Birthday and all he wanted was a lot of cards (Full Story Here). My little girl asked why I was crying (again - big baby). I explained to her the situation and the Birthday wish. She thought for a moment then asked if we knew him, when I told her no, she asked if we could still send him a card even if we don't know him . . . Like anyone would say no to THAT!!!! **TEARS** I explained to my little boy the situation and he said we had to make a 'Mater' car. So, we got to make a card for Hunter and just finished it tonight. I'm also entering it into MY Pink Stamper's challenge - the challenge is to make something cute. Although the card may not be the 'cutest' one I've ever made, I thought the story was. Happy Birthday Hunter!!!!!! This card is similar to a card I made for my Dad for Fathers Day, but it's still cute (if I do say so myself). One of my little brothers is serving an LDS mission in Slovenia. His birthday is coming up soon and my parents are sending him a care package. What is a care package without a card (especially from his niece and nephew). When I asked my little ones what they remember and love most about him, they told me that it was that he took them to feed the horses. Yes, it's the same answer they have for just about all of my family, but I know it means a lot to my little ones. This was made using my Gypsy and the Paper Doll Dress Up cartridge. Thanks so much for stopping by!! Wow, that was a hard! With all of the sweet bloggers out there, I had a hard time trying to decide who to give this award to. 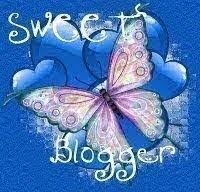 I truly believe all of you out there deserve the Sweet Blogger award! AWWWWWW! I feel so special! Gloria over at Girlia's Cards just gave me this super sweet award! YEAH!!!! Gloria - thanks so much!!! You just made my day! :) Thank you so much! This is a very, very simple Thank You card. Like I said, my card box is empty and needs to be filled up again. It's hard to see, but the cream colored background paper actually come embossed. I get it at a local paper store (LOVE IT). The phrase is from Gypsy Wanderings, the flower paper is from my scratch box. :) Thanks so much for stopping by! Well, this one is so simple, but I thought I'd post it. Nothing fancy, but I am in desperate need to re-fill my card box. Ok, so here's the thing. I think my hubby is feeling a little guilty! Hunting season is starting next week and we normally go as a family. Since our oldest is in school I'm not able to go (except for weekends). Well, we were talking and I asked if I could get 'a Cricut Cartridge that I really wanted'. He laughed, rolled his eyes, smiled and said that was fine (he sooo gets me). Well, the problem I have is deciding which one to get!!!!! I'd love to hear any of your thoughts!!!!! Here are two of the carts I'm thinking of, but I'd love to hear if you have one you can't live without!!! So over the weekend I loved hopping through several different blog hops (so much fun). Well along the way I stopped at The Purple Scrapper. 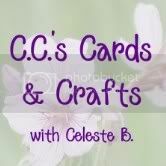 If you've never stopped by her blog, you really should! She is absolutely amazing, I just LOVE her work!!!! Well, I just found out today that I won a set of My Pink Stamper's stamps!!!! Can I tell you how excited I am!!!!!! I've heard great things about the stamps, and they have been on my wish list forever; unfortunately I hadn't been able to purchase any (yet). You'll have to check out what Jen made with the same stamp set (click here). I just want to give a HUGE shout-out to Jen at The Purple Scrapper! Thank you so much!! This really made my day to find out I won! THANK YOU, THANK YOU, THANK YOU! The word 'believe' is from Gypsy Wanderings. The frames are also from Gypsy Wanders and I did put one of them through the Cuttlebug. Thanks so much for stopping by!!! As many of you out there know - I live in a very small farming town! Funny thing is that we don't even live 'in the town'. Since we live so far from any big towns our Internet has a few problems here and there. Well, it's been giving me problems for the last three days!!!! GRRRR! So, sorry to those of you that I haven't stopped by yet - I'm working on it! :) Now onto my card . . . I made two of these cards for two of the ladies that I visit with each month. One is a new mommy so she is always busy with her new little one and both have been sick recently. The other was for a lady that I won't be visiting as much any more. It does have a scripture on it, so that may offend people. If so, I'm sorry, but it's part of who I am. :) I thought they turned out OK. You pull out the flowers to see the message. All of it was made with Walk in My Garden. Thanks so much for stopping by! This is just a place for me to organize my ideas. Use of my photos and/or artwork is for personal inspirations only. They are not to be copied for commercial advertising, challenges, contest submissions, publications or resale.